Ask the letting agent what the fee for setting up your tenancy covers. Government guidance states that agencies should not be charging ‘excessive fees that do not reflect the effort involved’. A credit check costs around £20, and the contract you sign will be a standard one that the agency has printed off in a matter of seconds, which will likely leave you wondering why the process is costing you hundreds of pounds. By the time you challenge the administration fee, you likely will have already paid it. It’s a hard one to challenge, as securing a place is usually dependent on paying it. However, you can ask for an itemised breakdown of the administration fee, to see where the agency say your money is going. If the agency can’t give a clear explanation, you can challenge them to give you some or all of it back. As per the guidance on holding deposits above, there is quite a lot of information that an agency should be providing you with before they take your money for administering the set-up of your tenancy. Agencies should also clearly list the fees involved in renting a property in their advertisements of it. If they haven’t done some or any of that, you can challenge them to give it you back. You can find a template letter below for challenging agency fees. Although such a clause is entirely legal, letting agents / landlords often don't draw the contents of this clause to the attention of tenants before they sign. Tenants can thus often find themselves paying for an inventory check from a company that are aligned with the letting agent themselves. It is worth establishing what the likely costs are for the inventory at the beginning of the tenancy, and asking for the clause to be removed if you are not provided with a formal inventory on entry to the flat (why should you pay for an inventory check on exit if you are not provided with one when you enter the flat?) Payment for inventory charges should be shared equally with the landlord, otherwise this could be an unfair clause in the tenancy agreement, as per the Consumer Rights Act 2015. You should ask the agency for a breakdown of inventory charges and check that these are split between you and the landlord. You can ask for this to be removed from the tenancy agreement. There is no legal requirement for tenants to pay for a professional clean (however, landlords may insist upon it - it is yet another example of the weak bargaining position that tenants often find themselves in). If the agency won’t remove the clause, you can ask them to amend it to say that you will be charged for a professional clean if the property is not left clean to a ‘professional standard’ when you leave. This would allow you to clean it yourself. Alternatively, if you can’t get it removed or amended, you can request that you administer the professional clean - rather than having to pay a sum of money to the agency for it - and that you will provide an invoice as proof of the work. Agencies will usually accept an invoice from a convincing-sounding cleaning company without further checks. Agencies also charge for all sorts of other ‘activities’, including renewing your contract, ‘checking in’ to a property, ‘checking out’, moving in on a Saturday, swapping a tenant over; you name it, they’ll charge for it. These fees will either be in your contract, or listed on the agency’s website. These should be clearly displayed on the agency’s website, no more than one click away from the front page. Any particularly high or unusual charges should be highlighted to you before you sign your tenancy agreement. Any fee charged for an activity where the agency is going to be able to cover those costs another way can be challenged as unreasonable - for example if they are charging you to move out of a property midway through your tenancy, given that the agency will be making money from the fees they charge to the next set of tenants. It is also misleading for agencies to charge high fees for activities such as contract renewal and to then justify them by claiming that a high level of work is involved, when all they actually have to do is print off the same contract as before. You should not be charged to move from a fixed term to a periodic (rolling) contract. Agencies should make clear how much of the fee they are charging is profit. If your agency has not done all or some of these things, you can challenge their fees. 6. At least a week before you are due to move in (giving time to negotiate, and before you have signed the agreement), challenge the agency to remove the fees you have found in the agreement (template letters below). You can challenge these fees by asking for an itemised breakdown of them. Legally, agency fees are covered by the Consumer Rights Act 2015, which states that agencies must provide tenants with an explanation ‘that is sufficient to enable a person who is liable to pay it to understand the service or cost that is covered by the fee or the purpose for which it is imposed’. This means that you can ask an agency to provide you with a costed, itemised breakdown of each fee. 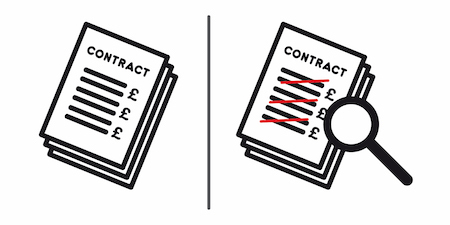 What costs, exactly, are involved in an £80 contract renewal fee, you can ask. Without these itemised costs, you are arguably unable ‘to understand the service or cost that is covered by the fee or the purpose for which it is imposed’, particularly given how significantly fees vary between agencies. Why, you might point out, does contract renewal cost £80 with some agencies, when others don’t even charge for it. You can use the template letter in this link to challenge agency fees. In our experience, perseverance is key. At a certain point, the administrative cost of responding to you becomes greater than the cost of giving in. There’s also no guarantee of success – an agency may just remain stubborn to your challenge. However, the more of us who do this, the harder that will be for them. If they don’t budge and you feel that the fee is unreasonable, you can always threaten to complain, or to take your complaint to the Property Ombudsman. This will at least waste the agency’s time, and might force them to back down. If you can find other tenants with the same agency to make this complaint with, even better, as you will be able to support each other and it will make the complaint stronger! We think all of these activities – challenging agencies on their fees, complaining about them – are more effective when done en masse. It makes us feel confident that we’re not alone, it gives the agency more work to do, and it lets the agency know that we as tenants are fighting back. If the agency is totally resistant to your challenge, you could always pursue a complaint against them – first via their internal complaints procedure, and second via the Property Ombudsman. We think this can be a useful thing to do not because it will necessarily force them to change their mind, but, again, because they might get so fed up of all the admin it generates that they give in. Perhaps you can challenge the agency along with the rest of your housemates, or perhaps you can put a callout to try and find other tenants with your agency who might want to join you in challenging them. We know this can seem daunting – if you’re thinking about doing it and would like our support, you can get in touch with us at housing@brightonsolfed.org.uk, or on 07427239960. Even just five tenants from the same agency challenging something like a contract renewal fee is going to create problems for them.